Never have I ever wanted to sip on a mint julep more than this watermelon one. Right now. I’ve made a bunch of similar mint juleps over the years – in a wide variety of flavors – my least favorite being pineapple but that’s probably because I was secretly pregnant at the time and couldn’t tell anyone or drink the entire thing. With how I feel about pineapple these days, I’d be all over that julep. Blueberry was probably my fave… up until now. Watermelon anything ranks high on my list and do you want to know something embarrassing? I like watermelon flavors so much that I actually even enjoy the fake watermelon flavors sometimes. I can distinctly tell a difference when it’s artificial watermelon versus fresh watermelon, but that doesn’t mean I’ll always pass up a piece of watermelon gum (not even kidding) or some tropical drink made with so-sweet-your-teeth-hurt watermelon liqueur. No discrimination from the watermelon gallery over here. Not, I’m not giving him mint juleps. But yes, I was giving him watermelon, because he loved it so much last summer. The past two days though, he wouldn’t even touch it and acted like it was covered in fleas or something. He looked at me like I was legitimately insane for even putting it on his plate. Maybe it was because it happened right after he licked all of the almond butter off of apple slices and found a box of graham crackers (again, yes this has happened twice) because he now sneaks into the pantry like he is 13 years old. But the watermelon? He preferred squeezing it as hard as he good and drenching himself in juice. In weirder mint julep news, last year I made this julep soaked fruit and topped it with… wait for it… fluffy whipped marshmallow. You can’t drink it over ice but you sure can eat it. Best of both worlds. It’s strong. If you’re weird about herby mint, it’s, like, doubly strong. But add a little fresh fruit and syrup and you might be sold. I’m obviously sold… because it’s PINK. Like I need another reason?! Add the watermelon to a high-powered blender and puree until smooth. Pour through a fine mesh sieve into a large measuring cup to remove any of the pulp. Combine sugar, mint and water together in a small saucepan and heat over high heat until simmering, stirring constantly. Reduce heat to low and cook for another minute or so, then set aside to cool completely. Remove mint before using. You can do this ahead of time and store it in the fridge. It’s the crushed ice that sets this drink apart for me! Stunning visual appeal =) I grow tons of mint, it has actually taken over my side yard completely. Besides making tea with it, I have zero good ideas on how to use it. And I was thinking to about juleps and isn’t there supposed to be bloggers posting something about this now? And now you have. So you made me happy! the crushed ice makes it for me too!! So pretty! Loving the color. I am actually not huge on bourbon either, but I’d give it another shot if it looked like this!! Yes yes yes! I was just telling Mark the other day how freakin’ excited I am for watermelon season. It looks like juleps are sort of like mojitos (which we love), so these are definitely happening this summer! yes totally! you guys need to try. call me jess anytime… HA! To everyone’s shocker, I am NOT a big fan of watermelon… I just find all the seeds so frustrating, and the fruit itself usually mealy and too sweet… But I like anything in mint julep, and am definitely pinning all three of these versions for future nights (yes, even the pineapple one!). the fruit is kind of mealy at times! i get that. Bourbon Juleps are my most favourite summer drink! And with my favourite summer fruit?? Weellll I just have to try this one!! OMG. YES. One of my spring goals this year was to perfect my mint julep recipe. I’m a KY gal at heart & love me some bourbon & mint & have been known to eat a half a watermelon a day for breakfast in the summer #whatever so this is my dream drink. Can’t wait to make it! & I live in Pittsburgh now, so heyyyy! Never have I ever wanted a cocktail before 10am until today. This watermelon julep looks perfect for spring! As much as I love watermelon, I hate cutting it. This might motivate me to cut one up again! it’s the worst. but not as bad as butternut squash. super fake sour watermelon gummy candy = best! (actually, grapefruit is best, but maaaan, those watermelon ones are delish). I’ll pretty much drink anything if it comes in pink. omg yes, the grapefruit gummy candy is killer. Yes! Just yes! This looks SO good! I will definitely be having one (or three) of these very soon! Seeing as my semester ends two days before the Derby, these drinks seem like the perfect way to celebrate only having one year of law school left. I am so jealous of your julep cups – any recommendations on where to purchase? 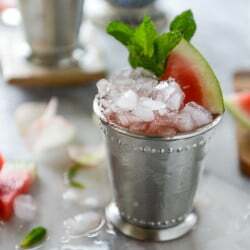 Blueberry mint juleps are my favorite, but I’ve never tried a watermelon one. Looks like a Kentucky Derby party is in order! Um yes. These. Those cups. Watermelon everything–I’m ready! I could probably even do the fake watermelon (Like a watermelon ring pop maybe?? I don’t know, that’s what popped into my head). Love these photos obviously! watermelon right pop – hellllllo flashback. This looks positively slurpable – and I don’t even care for bourbon! I love all things Julep. We really got into the race in the years we lived in the South and I’ve carried that tradition on with a party every year which of course HAS to feature a Mint Julep. My favorite? Not sure I can decide but a Blackberry one was beautiful and delicious and a peach one not far behind. I’ve been seeing watermelon at Sprouts for a long time, thinking I might take a chance on one of them and try this next; it’s gorgeous! Never have I ever wanted a mint julep until now. Oh my god this looks delicious. Wow. Looks smashing with easy to follow steps. Snaps are too too good. I gonna try this out. Thanks.